First-person view (FPV) drone pilots continue to push the boundaries of videography through filming style and location innovation. Russian pilot Sergey Belash (aka craig_dt) gives viewers an unprecedented look at the Central Air Force Museum in Monino, a suburb of Moscow. The museum is one of the world's largest aviation museums with 173 aircrafts and 127 aircraft engines on display. Prior to 1999 the museum was closed to the public because of its display of classified prototypes from the former Soviet Union. By gaining access to fly at the museum craig_dt juxtaposes the innovation of drone racing with the history of flight. The film features Cold War era aircrafts only available for viewing at the museum, including fighter planes like the Tupolev Tu-128 (Fiddler), Bombers such as the Myasishchev M-50 (Bounder), and the Tupolev Tu-95 (Bear). Most notably craig_dt was able to capture one of the only two produced Tupolev Tu-144 (Charger) jet airliners, a retired Russian supersonic transport aircraft. 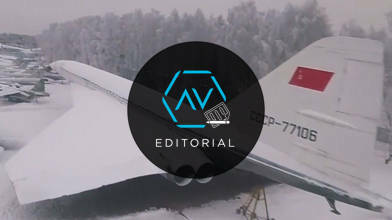 This FPV film is a testament to both aviation history and innovation.